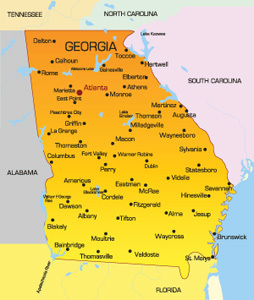 Georgia was the last of the original thirteen colonies and is now the 9th most populous state in the United States. It is bordered by Florida, Alabama, South Carolina, North Carolina and Tennessee. The state capital is Atlanta which has a population of 400,000. The busiest highways in the state are I-95 and I-85. There are also two major deep sea ports on the Atlantic Shore one of which is the Port of Savannah. There are many cultural attractions throughout the state such as the High Museum of Art in Atlanta or the Morris Museum of Art in Augusta. Stop by the Atlanta Braves Stadium or the Atlanta Falcons stadium for some family fun and good food. You can also take a stroll in one of the 63 parks in Georgia, 48 of which are state parks.